The AG2000 is a spool-type electromagnetic flowmeter for use in irrigation applications in 4” to 10” pipe. With no moving parts, these meters have unobstructed flow and are resistant to wear from debris found in ground or surface water. There are no bearings or propeller to wear out. Minimal straight pipe requirements allow AG2000 flow meters to be used in piping configurations where there is little space between the flow meters and an elbow. In chemigation applications, the flow meter should be installed upstream of the chemical injection point or enough downstream to allow thorough mixing of fluids ahead of the meter (see Tech Bulletin on Seametrics website Downloads page). 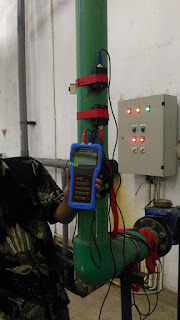 The standard electromagnetic flow meter AG2000 is battery powered. Where an external power source is available, the Magmeter AG2000 can be optionally converted to 7-26 Vdc, with the batteries then serving to maintain continuous operation in case of power failure. This configuration will prolong battery life indefinitely. The Electromagnetic flow meter comes with built-in pulse output (requires optional output cabling) for data logging or telemetry. Several pulse rates are available. An internal data logger is also available for secure flow logging (-127). A Seametrics FT420W indicator can be added if remote rate/total reading is desired, or an AO55W if a 4-20 mA (analog) signal is required. The Magmeter AG2000 has a seal wire to protect against unauthorized access. The seal can be broken to change units of measure, replace the battery pack, or to field-install a power/output cable. The optional cable can be factory- or field-installed for applications where external power is available and/or pulse output is needed. The accessory weather guard is recommended in outdoor applications.